So You Think You Can Coach? Dance in the moment with your clients, Discover the power of integrating Type and Temperament into your coaching that helps create new directions for your clients. Yes You Can Coach! Discover the secrets that all coaches know and learn proven methods of moving your clients forward from paralysis into action. Irene Anderson and Paul Chatterton will share many coaching techniques to help you create your own dance. Learn how to LISTEN for the inner voices (Inner Coach, Inner Critic). Who’s in the driver’s seat? No JUDGING! LEARN how to work with your client’s agenda, still your inner voices and LISTEN on a deep level. LEARN self management techniques. BE CURIOUS! Discover Type and Temperament behaviours that may become barriers. UNLOCK your inner leader. LEARN how to build accountability into your coaching. LEARN the art of asking POWERFUL questions that will help your clients uncover and explore CHOICES. What’s POSSIBLE? Get out of your Type or Temperament Box – Unlock your intuition to help shift perspectives. This will be an interactive – hands on session – come prepared to coach and be coached! And give and take feedback. Please note: This workshop will assume that participants have a basic understanding of type and temperament theory. If you don’t, but would still like to attend, please make sure that prior to the course you read Understanding Yourself and Others: An Introduction to Temperament by Linda V. Berens (available from Career/Life Skills Resources). In corporate and educational settings, effective training and development is essential to meeting strategic objectives and learning outcomes. We know that an understanding of personality or temperament theory is a very effective tool in facilitating and positively affirming self-discovery regardless of the environment. Using Personality Dimensions® as the vehicle by which facilitators will be able to design and implement workshops to work more effectively with their participants. In this highly interactive workshop, through self-discovery methods, you will learn how each personality/temperament type prefers to learn and to be taught in a presentation. In addition, learning/teaching methodologies from master theorists like David Kolb and Bernice McCarthy will be paired with your knowledge of Personality Dimensions® to provide you with the ultimate tools to plan and deliver workshops that make a lasting and positive impact. In this humourous, engaging session, based on hundreds of PD workshops, you will be introduced to your own learning and facilitation styles and how you might be able to tweak them to give you that value added component your participants will appreciate. Be sure to sign up for Michael and Larry’s session here. 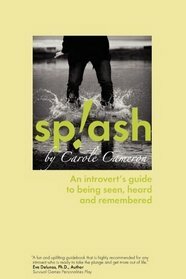 Splash by its very name sets the reader up for a swimming analogy, which Cameron delivers consistently throughout her fun, practical, and helpful guide for introverts. It is not a survival guide; it is a tool introverts can use to form new habits in order to create better life experiences for themselves. Carole, an introvert herself, asks the reader to complete the “Splash test” that confirms introversion. By the time I read through her list, I was actually chuckling because this captures the introvert in a humourous, yet authentic way. I know because I am one! Carole’s swimming analogy continues as she describes “bathing suits” in four different colours. You guessed it, in her innovative way, Carole introduces temperament theory, describing the four types of introverts, including what each looks like when out of energy. The whole point of Splash is not to let introverts off the hook because they feel they are swimming upstream and have to work harder than extraverts. Instead, this self-professed introvert encourages other introverts to look at themselves in “the reflection pool” and polish their image in order to be better seen, heard and remembered. This book is about professional development for the introvert, so they can make a splash whenever they choose to dive into the public forum. But before diving in, a new swimmer must first dip his/her big toe into the water. Carole gently leads her fellow introverts into the water through her five practical strategies. First, introverts must decide to wear their particular “bathing suit” with confidence; that is, decide to use the strengths, talents, abilities, etc of our temperament to their advantage. The author continues to guide introverts through her next three strategies towards success: how introverts can make connections, how they can create positive attitudes, and how they can choose to manage their energy level. Finally, she encourages them to make the changes required, which may even be finding a “new pond”. Every so often one comes across a little gem; for introverts who want to create a buzz when they walk into the room, Splash is that little gem. Take the plunge and read the book! Splash is available to order from amazon.ca, or direct from the publisher at www.clsr.ca. Don’t forget to check out Carole’s Splash website at www.make-a-splash.ca. This entry was posted in Myers Briggs, Personality Dimensions, Personality Type. Bookmark the permalink. Personality Dimensions® A common Language in helping to Understand what makes people ‘tick’.